Let’s assume, there exists an application, which is already heavily relying on NHibernate. This app is supposed to be extended. All wordings are currently available in a single locale and re stored in the database. This is matter to change, since we want to introduce multi-language capabilities for our wordings. The simplest way to achieve the requirement would be to extend the domain-model in such a way, that a new column would be added to the tables in the database. This column would contain the locale of the text. Instead of a single row for each text, we would end up with a single row for each locale for each text. In order to retrieve a certain text from the wording-table of the database, we not only need to know which text to get, but we also need to know which local of the text we need to get. So this would end up in an additional criteria when retrieving data from the database. This is the point where NHibernates comes into play. NHibernate offers global filters, which can be used in conjunction with regular queries. I will demonstrate how to make use of these filter by showing a little example. Let’s take a small app, which is persisting pizza and toppings using NHibernate. Therefore we have POCOs and according mappings. As you can see, pizza as well as toppings each have a name. A pizza also has a set of toppings. So far, so good. To support multiple locales we could go several ways. We could introduces a property called Name_de as well as Name_en to support german (DE) and englisch (EN) locales. An alternative approach would be, to add a property called Locale, which hold the locale of the name. If I would like to get english pizzas I would need to filter for pizza entities, which have a locale of “en”. OK, let’s go with the second alternative. But how do I restrict my queries to only fetch pizza entities with locale=en? With NHibernate-Filter! First of all we need to define a filter. The next step is, to include this newly created filter in the mappings. This way I specify that by using the filter I want to restrict my results by the column Locale. It’s important to notice, that this will only happen when I’m actually using this filter. When I’m not using the filter this restriction is being ignored. Thus: the filter is optional! OK, so how does this actually work in my application – how do I use such a filter? What I don’t want: I don’t want to change all my existing queries to include a filter for the locale column. Instead I’m just activating the previously defined filter and assign a certain value. That’s it. There is nothing more to it. I can leave all my queries the way they are and just execute them like before. Let’s take a look at the SQL statements that are being created, because they will show the usage of the filter. This shows the strength of NHibernate-Filters. Besides the modification of the mappings and the activation of the filter I don’t need to modify anything. I don’t need to alter my queries. The filter is being applied by NHibernate behind the scenes. This also works in more complex scenarios. Let’s assume I have a pizza with several toppings. I only want to get a pizza in german – and of course I also want to get german toppings as well. This works as too. I already activated and set the filter in the constructor of my class – so I don’t need to do this over again. At least not as long as I reuse the same session. Let’s take a look at the SQL send tot eh database – this is just impressive! 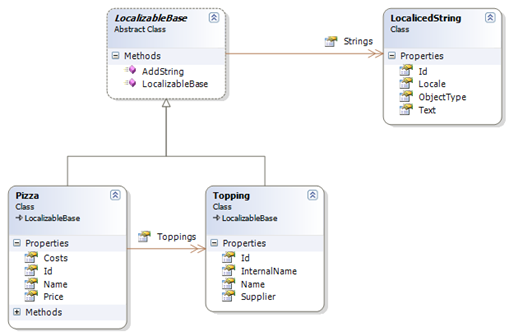 The use of NHibernate-Filters introduces a very transparent way to extend the applicationlogic to include additional filter criteria. Instead of storing a newly localized text in a seperate column, this doesn’t require any schema-changes. Only the rows to a certain locale are being retrieved, this might reduced bandwith. OK, so I worked around the first issues with the setup of the NHibernateIntagration facility and fluent NHibernate, and now are new issues just showing up. This looks pretty slick – in fact this is looking so darn cool, I want it to work! But what is showing up in my testrunner is not very re-assuring: No persister found for Entity Account. The key is the configurationBuilder. This offers a hook in the configuration-building-process of the facility. This is the recommended route to read the fluent mappings from the assembly and to add them to the NHibernate configuration. The key is the AddMappingsFromAssembly extension-method. So, this is where I stand right now – and this is failing. So there it is – black-on-white: the actual mapping is commented out – and no-one knows really why. Since fluent is just everywhere, I thought that I would have to go the fluent NHibernate road as well. Turned out to be quite wacky. First of – I just wrapped up all my referenced assemblies: Castle Windsor 2.0 (which is actually internally labeled as 1.1) as well as all the other stuff and NHibernate 2.1 GA. Then adding the new kind in town: Fluent NHibernate. And this is where the trouble begins … Fluent NHibernate is build against 2.1.0.4000 of NHibernate (= 2.1 GA). This is good, since I just downloaded this exact version. But wait – what’s my most favorite NHIntegrationFacility doing there – it’s actually linked against 2.1.0.1003. So this screws me off. Picture the case where you want to insert/manipulate a mass of data using your already in place NHibernate infrastructure. This has the drawback of producing a single INSERT per save call, and thus creating 100 roundtrips to the database; one per insert. Further more the actual INSERT command will be re-constructed for each single Save call. This will at least reuse the command-object created for the first Save call. If your’re using MS-SQL you can benefit from further enhancements. NHibernate offers the capability of batching statements. By adding a configuration setting for hibernate.adonet.batch_size with a value greater than 0 will enable batching. In conjunction with the transaction only after the in batch_size specified commands have been recorded this batch is send to the DB. So with a hibernate.adonet.batch_size of 10 the above code would result in 10 roundtrips instead of the original 100.